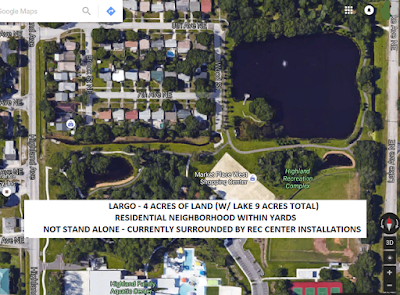 We posted here previously about the proposed zip line in Largo that residents nearby opposed. The next step was the September 6th 2nd pubic hearing. Residents who lived nearby and who were impacted the most showed up again on September 6th to voice their opposition and request the commission reject the "tree adventure" proposal. To their dismay, the Largo city commission voted 5-2 to pass Ordinance 2016-82 authorizing the city to lease city property at Highlands Recreation Complex for a tree adventure course (aka zip line) to vendor Treeumph. A copy of the ordinance can be found here. The video of the September 6th city county meeting is here. At 18:35 of the video Recreation Center Director Joan Byrne made her introductory remarks stating, somewhat defensively, about what steps the city had taken over the last couple of months on the issues. The big question that seems to still loom large is how did this proposed project get so far along, to the point where the city was being asked to sign a contract with Treeumph, before the neighboring residents were actively engaged? Public comment on the ordinance began at 31.11 of the video and most who spoke were opposed. The reasons stated by those who spoke in opposition were many, including noise, traffic, parking issues, liability issues, reduction of the quality of life to those most impacted, were all the appropriate studies done, is the "tree adventure" actually an amusement park, questions about the contract and numerous other reasons. Again, a big concern regarded the process used by the city to propose the project and continue moving it along. The opposition felt the process was not transparent, many did not know a "tree adventure" included a zip line so close to their private property and that those most impacted were not appropriately notified and engaged early in the process. There were several who spoke in support of the zip line and thought it would be good for property values in the area, be good for business, be a positive revenue generator for the city and be an asset to the city. We understand there are no restrictions on where the revenue from this project can be spent or any requirements that a portion of the revenue be spent on the Highlands Recreation complex where the "tree adventure" zip line would be. After the public hearing, commissioners Holmes and Carroll voiced their concerns about the project. Commissioner Carroll appeared concerned over the process by essentially asking how would this have been handled differently if this was being requested by a private developer. The final vote was 5-2, with Holmes and Carroll voting no. However, that vote did not stop the determined opposition. They continued to research the issue, interrogate the vendor contract, interrogate the process and procedures and sent a formal Letter of Objection to Ordinance 2016-82 dated October 4, 2016 to the Largo city commission stating numerous specific objections. The zip line opponents then attended the October 6 city commission meeting to ask the commission during public comment to reconsider the zip line ordinance. The Eye was there. One spokesperson for the opposition group publicly read the formal opposition letter they had sent to the commissioners. A copy of that letter (click to enlarge) is below or can be found here. Section 1 of Ordinance 2016-82 states the term of the lease is 5 years. Largo city commission cannot approve a lease longer than 5 years without voter approval. However, the objection letter states that the city lease with Treeumph presented to the commissioners is actually a 10 year lease with a schedule of termination payments amortized over 10 years. It is interesting that in 2014 eight Largo Charter amendments were proposed by the Largo Charter Review Committee. The Largo city commission voted in July 2014 to put all eight amendments as referendums on the 2014 general election ballot. Largo amendment #4 asked to change the current provision requiring a referendum for city leases greater than five years to requiring a referendum for city leases greater than 10 years (see below). That referendum was defeated in 2014 54-46 according to election results from the Pinellas County SOE. Since the referendum was defeated, there must be a concern from Largo voters that they do want some control over these decisions. According to the zip line opponents, no permits have been issued for the project and the project has not started. They contend the lease is actually a 10 year lease that requires voter approval. At the October 6 Largo city commission, we caught up with Largo resident Nancy Lamagna, a spokesperson for the zip line opponents who read the Letter of Objection at the meeting. Nancy provided some additional insight regarding the opponents concerns and some next steps they would like to see occur. A key issue could be whether the Treeumph lease is a 10 year lease that requires voter approval. Will the city of Largo address the specific objections raised in the Letter of Objection sent by the opponents and the objections that continue to be raised by those most impacted by the zip line project? Because the Largo zip line issue apparently is not going away. Yet, the city officials continue to tout how much they want the "community" to get involved. Why, if they're just going to be ignored anyway? The arrogance is just ridiculous.